I was with my brother Chris and my other siblings. I took them up a towering mountain to a special place. From the zenith of the mountain we could see the entire cosmos moving in slow motion. It was a spectacular sight. Galaxies, planets, stars, radiant bodies of light and divine rays rotating, revolving heavenly splendor. Mesmerized we watched in absolute awe, this wondrous vista. After some time, I took my brother Chris further up the mountain, I directed my brother to put on a special comet suit and I did likewise. Then we dived into the resplendent firmament our comet tails flashing. My other siblings followed and we soared through the galaxies in celestial merriment. to protect my daughter. We continued to float through the dazzling Cosmos. Happy and buoyant we came back down the mountain. Later I asked my brother Chris if he would like to go back up the mountain again. He of course agreed to rendezvous at another point in time. When I woke up from this dream I felt a little discomfort it was such an intense experience. 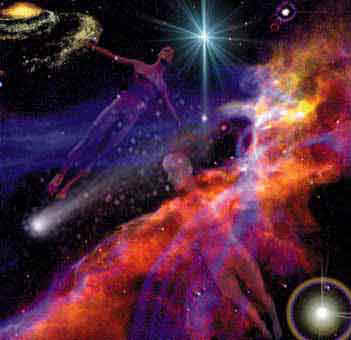 but that feeling wore off quickly as I recalled the beauty and grandeur of these astral travels.